It’s now September—the first month since springtime to have an “R” in its name—which means that according to that “little pearl of folk wisdom,” it’s oyster season! Few people think of Morocco when they think of oysters. Seafood overall sometimes comes as a surprise to travelers expecting to eat chicken tagine, lamb merguez, and couscous against a desert landscape. But like its topography—which ranges from snow-capped mountains to sun-drenched dunes—Moroccan cuisine is diverse; and with both Mediterranean and Atlantic coastlines, tourists and natives alike indulge in all kinds of seafood, from shrimp to squid to sardines and more. In fact, Morocco is “one of the world’s largest producers of sardines,” according to Oxford Business Group’s (OBG) 2013 Morocco Report; and with its fishing industry accounting for 2-3% of its GDP, “The kingdom currently provides roughly 3.3% of the global supply of seafood products”! 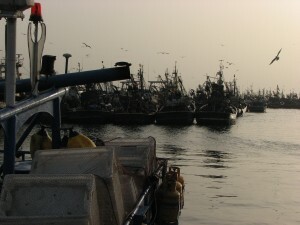 Though commercial fisheries can be found in the port cities of Agadir and Tan Tan, the vast majority of Morocco’s annual catch is fished off the coastlines of Laâyoune and Dakhla in Morocco’s southern provinces. As explained by Jeune Afrqiue, Kandy was something of a pioneer when he established an oyster farm in Dakhla in 2002. At the time, oyster farming in Morocco was concentrated in Oualidia, south of Casablanca. But since about 2007, Dakhla has become the country’s oyster pearl, so to speak, specializing in the species crassostrea gigas, also known as the Pacific oyster, Japanese oyster, or Miyagi oyster. 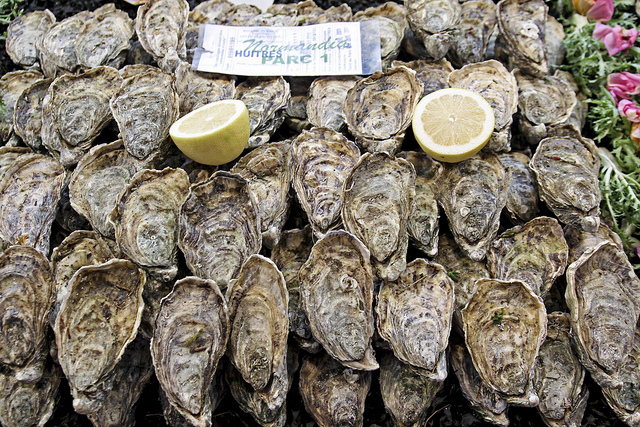 Morocco’s oyster production remains modest, largely feeding national markets. But Morocco’s Ministry of Agriculture and Maritime Fishing hopes to change that. In 2009, the government launched a development program, “Plan Halieutis,” that “aims to boost [fishing] sector turnover… by 2020 by streamlining fisheries practices, strengthening infrastructure and expanding local processing industries,” writes OBG. Among the plan’s top priorities is to strengthen aquaculture—or fish and shellfish farming, both to increase production and improve sustainability. Morocco’s National Agency for the Development of Aquaculture even developed a guide to oyster farming, complete with initial start up cost estimates and market potential. And earlier this year, the Ministry partnered with Japan’s Agency for International Cooperation to fund an oyster farming research center in Tetouan to improve and share best practices in hopes of growing the industry. Though you can’t buy Dakhla oysters at your local fish market this fall, it could be just a matter of time!